She’s an athlete, a trooper, and what a snowboarder. In 2006, coming into the home stretch of the snowboardcross (which is like a roller derby down the mountain), Lindsey was way out front with her gold medal almost around her neck. On the last jump before the podium she got more-than-called-for air and she did this method grab (above) just because it felt right. She wiped out and went from Gold to goat. Can’t ya just see her shrugging it off? I fell, it’s all a part of the game. 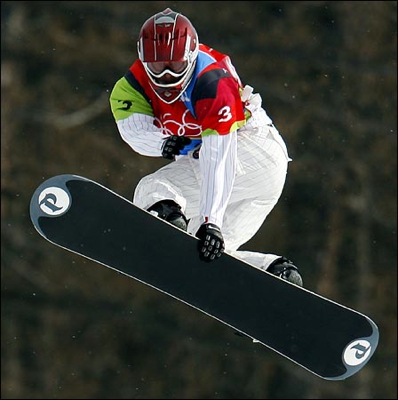 Now, in the 2010 Olympic Winter Games snowboardcross, Lucky Lindsey Jacobellis took a jump higher than her opponents, didn’t plant it well and skidded out of bounds. It was over for her. This time getting up didn’t matter, her race was done – out of bounds meant game over. “I just landed a little front-footed. I feel OK, though. Sometimes, you can’t control the things you want to. “We fall but we keep getting up.